Developer website forum - technical support. 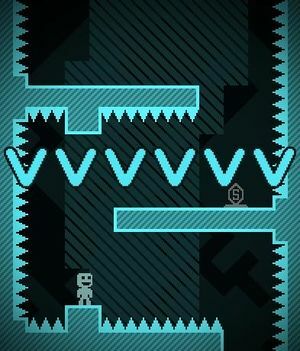 A limited version of VVVVVV, only containing the level editor and player made levels, is available here for free. Additional player made levels recommended by the developer can be found here and new levels can be found here. Older save games (from before 1.2) can be converted to a new format using ConVVVVVVerter utility. Scales from 320x240. Can be letterboxed or stretched to fit screen. Upscaling method can be set to Integer scaled, Nearest Neighbor, or Linear. Frame rate is capped at 30 FPS. Game speed is bound to frame rate. Allows reduction of visual effects. Gameplay itself does not require color discretion. 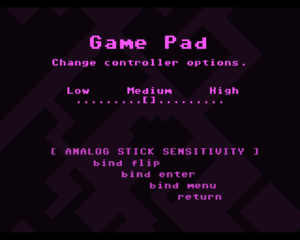 Analog stick sensitivity option is for joystick deadzone. 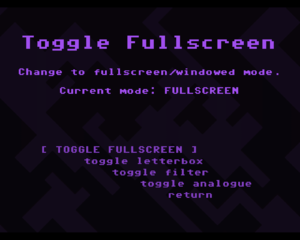 SDL2 Handles input and windowing.